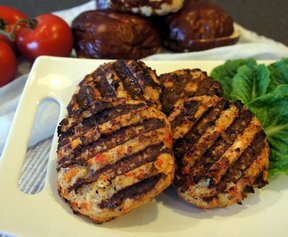 The sauteed vegetables mixed in with the turkey keep these burgers moist and juicy. You'll enjoy these healthy burgers more than you think, maybe more than the beef ones. In a large bowl, combine meat, breadcrumbs, egg, tomato and seasonings. Mix just until combined. In a skillet, heat olive oil over medium heat. Saute onion, garlic and pepper until softened. Add carrots and mushrooms and heat until desired tenderness; cool. Add cooled vegetables to meat mixture and combine. Form into 4 patties. Coat grill with non-stick spray and cook patties for 4-6 minutes per side. Serve on wheat or pretzel buns and top with lettuce.